Domestic politics are a more natural explanations for Pyongyang’s political moves, like the recently announced amnesty. North Korea appears in the headlines and front pages of newspapers on an almost daily basis. Major news outlets now report on domestic stories that would likely never have been picked up some years ago, such as this one, about Kim Jong Un’s anger over a deficient construction project of a power plant in the northeast of the country. And it is only natural to want to place isolated events into a broader narrative. Given that news of even fairly minor events relating to North Korea now circulate globally, it would be easy to interpret virtually everything the regime does as pertaining primarily to the international process Pyongyang is involved in, namely negotiating with both South Korea and the United States. Often, this is not the case. North Korea remains a country, too, with its own internal logic and political dynamics. That is not to say that the regime isn’t eager to present itself in as much of a favorable light as possible towards the international audience, but that’s not the main reason for all of its actions. Those who hope for a blanket liberalization of the system following the changes in North Korea’s international relations so far have few reasons to be optimistic. Consider the large-scale amnesty, which will go into effect on August 1, 2018, that the regime announced it will grant to people sentenced for crimes against “the state and the people.” It was announced on the front page of the North Korean daily newspaper Rodong Sinmun on July 16. The announcement promised that the state would take measures to assure the former prisoners are integrated into society again, so that they can work and live normal lives. The decision itself came in the form of a decree by the Presidium of the Supreme People’s Assembly, North Korea’s rubber-stamp parliament. Now, this would be easy to interpret in any number of ways: as a sign of domestic thaw while North Korea prepares to open up (whatever that actually means), a signal to the world that the country is taking action to scale down its horrendous infringements on basic human freedoms, a first step in a process toward greater social change and reform, and so on and so forth. Most likely, it is none of the above. But with North Korea currently so enmeshed in several international processes, the local cannot always be so easily separated from the international, and news is often overinterpreted beyond what is reasonable. In fact, amnesties for prisoners are not a new phenomenon in North Korea. With a system that relies so much on arbitrary policies, they make a great deal of sense. No one gets a fair trial, but on the flipside, everyone can potentially benefit from blanket-statement state directives. The amnesty the regime just announced is the third since Kim Jong Un came to power in December 2011. Kim’s first, in 2012, commemorated the 100-year anniversary of the birth of North Korea’s founder and constitutionally eternal president, Kim Il Sung. The second, in 2015, was launched in honor of the 70-year anniversary of the liberation of Korea from Japanese colonial rule and the foundation of the Korean Worker’s Party in 1945. The latest one commemorates the 70-year anniversary of the founding of the North Korean republic, on September 9, 1948. It remains unclear precisely which prisoners — and how many — benefit from these amnesties. As Christopher Green points out, they occur so regularly that families of prisoners likely expect them to happen. Actions like the amnesty may be primarily symbolic, to display the leader’s benevolence. But there may well be a practical side to them as well, such as unloading some of the pressure from the prison system. Large-scale actions such as this one are, in any case, practically easier than to have the justice system thoroughly work through each individual’s case, giving some semblance of due process, which does not exist in North Korea. The practice goes back much further than the 2000s. In 1953, for example, shortly after the war, the state decreed an amnesty for former fighters and agents who fought for South Korea during the Korean War (1950–1953). When the war first ended, the state launched a campaign to find former intelligence agents dropped on North Korean territory. This led to various abuses by local officials and self-defense militias, who used their power to seize property from suspected former spies and enrich themselves, which even Kim Il Sung pointed out. An amnesty was announced in 1953, likely to calm the unrest and stifle the abuse of power by local functionaries (for more on these events, Balázs Szalontai’s Kim Il Sung in the Khrushchev Era). None of this is to say that the North Korean regime does not consider the international audience in the way it chooses to present its domestic actions. Surely, it considers how events that it publicizes through its state media reflect on its international image, not least since its media channels are perhaps more widely read than ever before by foreign reporters and analysts (and some in the general public too). It is also important to pay attention to events on the ground in North Korea that the regime does not publicize. No international media has, at least to my knowledge, covered the extensive market crackdowns launched by the regime in the wake of the “spring of summits.” The indispensable Daily NK, founded and run mainly by North Korean defectors in Seoul, has reported via its sources inside North Korea that the regime has cracked down on private market activity and foreign information throughout July. Under the banner of “eradicating anti-socialist elements,” the regime has reportedly searched the homes of citizens, at least in parts of the country, for excessive stashes of cash and goods that reflect “capitalist culture.” Included in this nebulous category are, for example, South Korean goods, including movies and music. Prior to the U.S.-North Korea summit, Daily NK reports, the state gathered Party cadres for a lecture, stating that as imperialist ideological influences threaten to spread into the country with greater vigor, the “door of Juche (North Korea’s state ideology of self-reliance)” must be shut even tighter. Dyeing one’s hair, wearing “decadent clothing” such as long socks with flowery patterns or clothes with English-language letters on them, criticizing Party policies, consuming foreign culture, owning illegal cell phones, watching South Korean movies, and listening to foreign radio broadcasts all connote anti-socialist, unacceptable behavior, and will lead to culprits being subject to “severe punishment without trial.” Women caught wearing skirts ending above the knee will be fined 30 Chinese yuan, 38,250 North Korean won according to real exchange rate figures (1 yuan = 1,275 won). That’s enough to buy about 8 kilos of North Korean rice on the semi-private markets. The crackdown hits against the sort of private economic activity that would otherwise be permitted, or which the state would at least turn a blind eye to. South Korean media consumption would be a sensitive matter in normal times as well, but it seems like the regime is hitting not only against such habits with particular vigor, but also against some market trading practices which it has more or less passively accepted in the past few years. This shows how pernicious North Korea’s marketization process really is. So much of it has relied on changes in practice rather than in the makeup of the system and the laws that guide it. 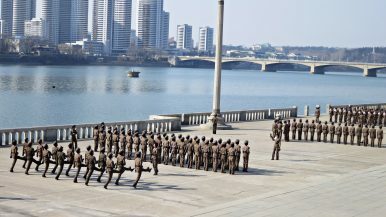 Under Kim Jong Un, the state has largely desisted from large-scale crackdowns of the sort that occurred fairly regularly under Kim Jong Il’s tenure (1994–2011). With North Korea engaging in international contacts to a degree virtually unprecedented since the days of Kim Il Sung, the state is forced to work all the harder to keep the population isolated from foreign influences in ideology and culture. Contrary to what some hope and believe, a North Korea increasingly engaged in international contacts does not necessarily translate into a more open society. Earlier this year, Thae Yong Ho, former North Korean deputy ambassador to the United Kingdom who defected to South Korea in 2016, predicted precisely this: that the regime would deem it necessary to impose stricter social control to keep out information from the outside world. The current market crackdown, so far, seems to prove him right. To sum up: all politics is local, in North Korea and everywhere else. The North Korean regime, like other governments, is complex, and few of its actions are solely or even primarily geared toward the international audience. Whether or not something is part of a broader, longer trend is impossible to tell right away. The North Korean regime is no static monolith, but nothing we’ve seen so far from Kim Jong Un indicates that dramatic changes to the system will come anytime soon. A longer version of this piece was originally published by the Foreign Policy Research Institute (FPRI). Will Marketization Bring Down the North Korean Regime? The Kim regime has turned its new economic elites into an increasingly important source of revenue. At Trump-Kim 2.0, Don’t Forget North Korea’s MarketsNorth Korea: A Hermit No MoreA Generational Shift in Pyongyang: Is Change Ahead?The Psychology of North Korea’s Kim Jong-un: The Measure of a ManA Trump-Kim Summit: How Did We Get Here, and What's Next?